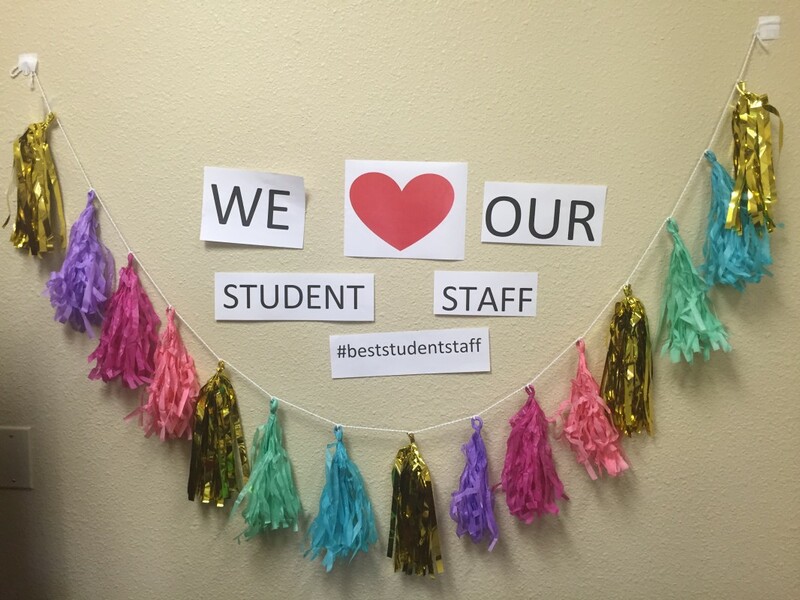 All staff members want to know that their contributions are important to the success of the department. Here are some suggestions to acknowledge your student staff members during Student Employment Month in April, and throughout the year. Tailor these ideas to fit with the culture of your department. Look around the office or at home for a white elephant item. Name the item for the award (Employee of the Month/Week, Great Idea Award, Gotcha Award—catch someone in the act of doing something right) and then make the first presentation of the award during Student Employment Month in April. Use social media: Post images of your students at work and laud their excellence! Use #loggersatwork to tag your posts. Don't have a departmental account? 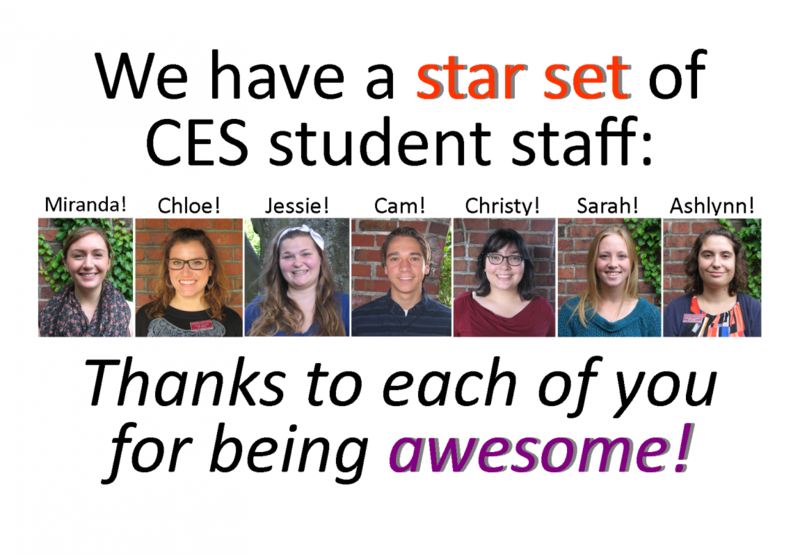 Send an email to CES with your celebratory shout out to recognize your student staff on the CEStweets, Facebook, and Instagram pages, particularly during Student Employment Month in April. Attach a photo of your students in action—or your Student Employment month celebration—to go with your message! Prepare "Certificates of Excellence" citing students for excellence and present the award with fanfare. Place an ad in the campus newspaper (The Trail), on your website, or in your departmental newsletter thanking your student staff members. Purchase or make blank certificates and make up unique awards such as "best telephone voice," "best Web surfer," "most customer service oriented," etc. 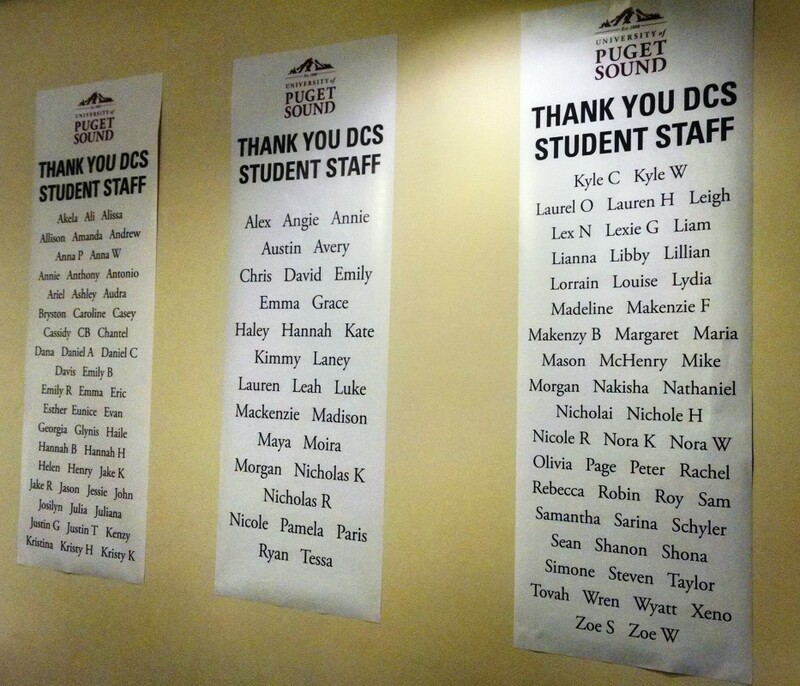 Ask the department head to write letters thanking student staff members for their contributions to departmental success. With the student's permission, write a letter to their family and let them know what the student does, how their work impacts your department, and share kudos. Chalk the sidewalk in front of your office (request permission online) or post a sign on the door saying "thanks" to your student staff members. PDA—Public Displays of Acknowledgment: Simply thank staff members publicly during a staff meeting or gathering. Training: Ask top performing students to help train and welcome new staff members or offer a training session for peers during a staff meeting. Shadow: Invite a student or students to shadow your professional staff meeting or some of your daily work or projects. 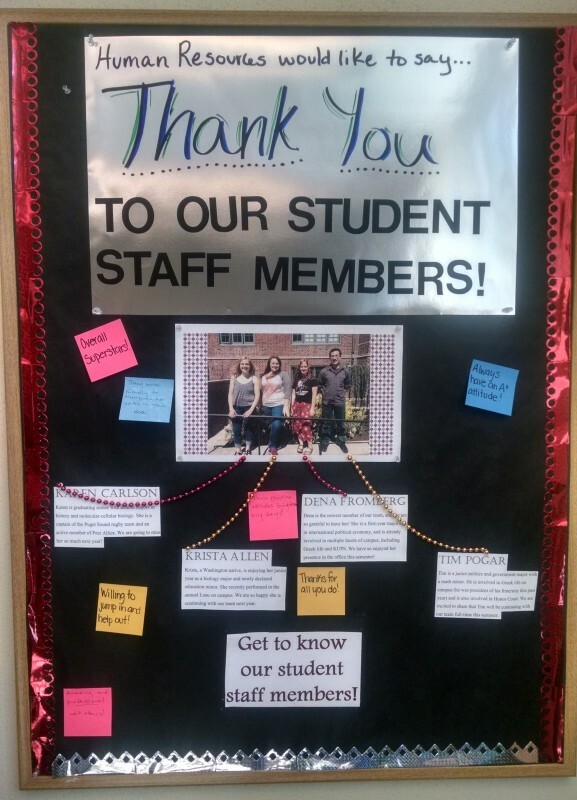 Create a bulletin board collage with photos and lists of the ways student staff members contribute to your department. Draw an outline of your hand on colored paper and write "High Five" over the top. Put the student's name in the middle and write 5 positive attributes or contributions around the hand. Post in a common area. 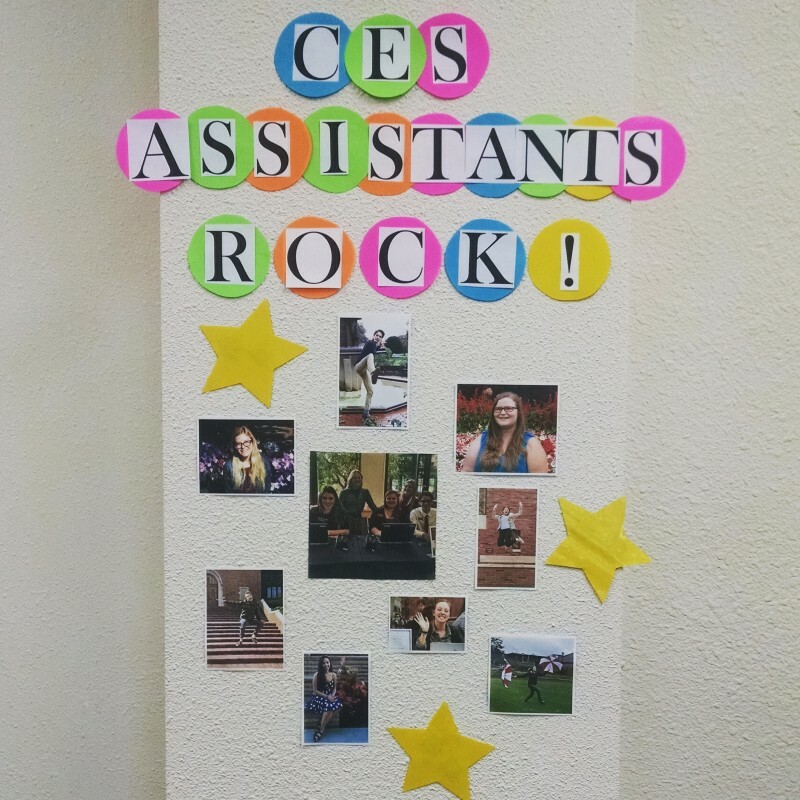 Select a theme and decorate an office wall, door, or desk in recognition of your student staff members. Take student staff members out to lunch, or host a departmental open house for all student staff members. Bring in treats or lunch. Have a cookie exchange. Bake cookies and place them in personalized take-out boxes for each student staff member. Attach a label that says "Kudos for a job well done!" to a Kudos candy bar. Friendship Plant: Take cuttings from a plant in the office and give to each student as a live "connection" to the office. Good Egg Award: Fill plastic Easter Eggs with goodies and give out with "Good Egg" certificates listing what the student did to deserve this award. Pat on the Back: Draw an outline of your hand on a piece of paper. Photocopy enough copies for all students in your office. On each hand write a note that tells the student why they deserve a "Pat on the Back." Create a coupon booklet with coupons for a free can of soda, movie, video rental from the bookstore, home baked goodies, ready-made take-home dinner... Be creative! Take a group picture to give out at the end of the year. Peruse the CES Pinterest board for inspiration. 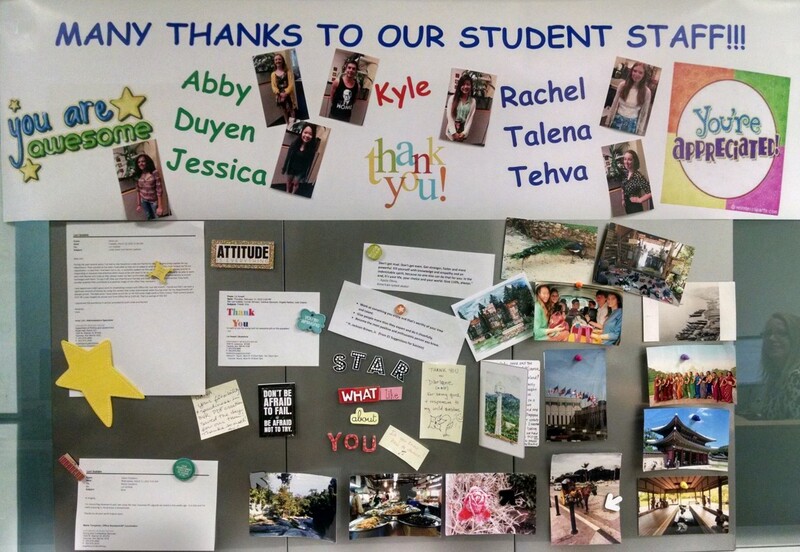 Thank you for all you do to orient, train, motivate, and acknowledge student staff members!